Poland – Alcons Audio has recently added another new territory to its global spread of users, with Polish event production company Offstage using its QR, QM and VR series pro-ribbon systems on a wide range of events. 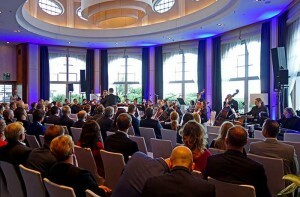 Two of the most recent have been corporate orchestral concerts in the Baltic resort of Sopot. Based in Łęgowo, near Gdansk, Offstage provides concert sound, lighting and staging services for both national and international clients. In September, its Alcons pro-ribbon loudspeakers were used on a corporate event at the Sheraton Hotel in Sopot. 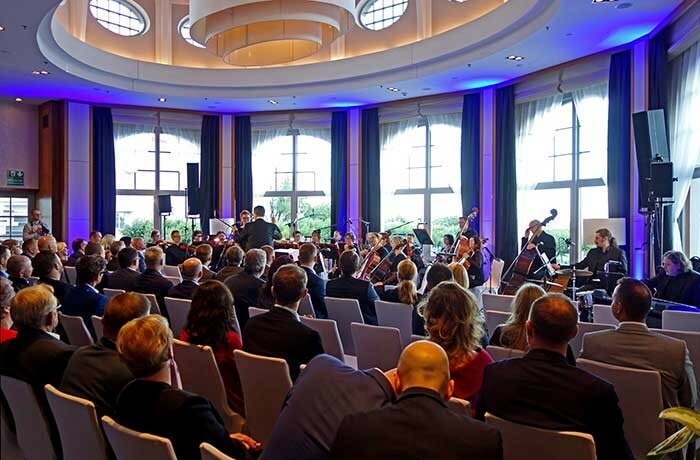 Here the Polska Filharmonia Kameralna Sopot orchestra and guest performers entertained guests in the hotel’s Baltic Panorama Ballroom, followed by a party with entertainment by the Jurek Detko Band. For the orchestral concert, Offstage used L-R arrays of an Alcons QR24 modular line-source array column and QM24 LMF array extension, plus VR8 compact versatile monitors as frontfills. The system was powered by a Sentinel3 amplified loudspeaker controller. For the party, which took place in a different part of the ballroom, two VR8s and a Sentinel10 were used. The two-way QR24’s symmetrical design and the patented horizontal dispersion of its pro-ribbon HF drivers delivers seamless coverage and exceptional off-axis sound. Its unique, SPL-independent intelligibility-over-distance means that high quality audio is delivered to the back of the audience in even the most acoustically-challenging environments. For aesthetic reasons, the client asked if the system could be placed behind the orchestra, to keep the stage as clear as possible. “Every time we work with an orchestra we want to get as natural a sound as possible,” says Offstage owner Przemysław Waszkiewicz. “The QR24 was a perfect solution because the sound is so precisely directional. We could project it above the musicians’ heads and microphones, completely avoiding any feedback. The audience was very pleased with the quality of the sound. The client was so impressed with the Alcons systems that they asked Offstage to use them again at another event in October.